The rhizome of the perennial herbaceous plants Atractylodes macrocephala Koidz. of family Compositae. Mainly produced in Zhejiang, Hubei and Hunan provinces in China. The one produced in Yuqian of Zhejiang province is best, which is also called Yu Zhu. Sweet smell, sweet and slightly pungent. 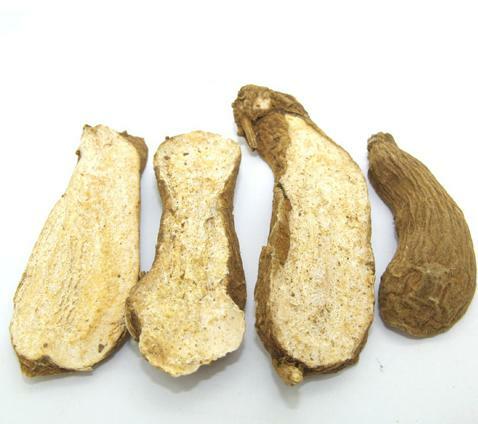 Big, firm, without hollow, strong fragrance, white-yellow cross section, sticky. Sliced, unprocessed, or stir-baked with bran or earth. Sweet, bitter, warm; spleen and stomach meridians entered. Tonify spleen qi, dry dampness, induce diuresis, arrest sweating and prevent abortion. It is praised as "the most important herb of spleen qi tonifying and spleen invigorating", because it can tonify qi and invigorate spleen. 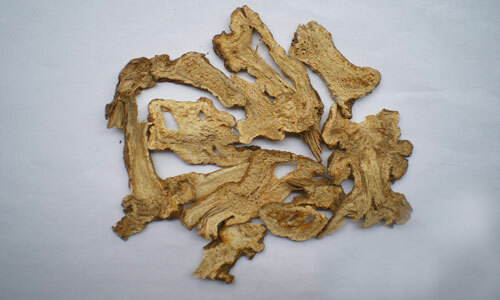 It is especially indicated for poor appetite, loose stool, diarrhea, phlegm-fluid, edema, and leukorrhagia due to spleen deficiency with dampness stagnation, because it can dry dampness, induce diuresis too. 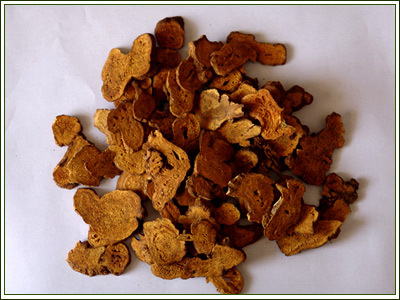 For poor appetite, loose stool and diarrhea due to spleen deficiency with dampness, it is commonly combined with qi and spleen tonics, diuretics and damp-eliminating herbs. For instance, it is used with Ren Shen and Fu Ling in Si Jun Zi Tang from He Ji Ju Fang. For phlegm-fluid stagnating internally due to deficiency of middle yang and spleen, it is combined with herbs of warming yang, generating qi, inducing diuresis and eliminating dampness. For instance, it is used with Gui Zhi and Fu Ling in Ling Gui Zhu Gan Tang from Jin Gui Yao Lue. For edema due to spleen deficiency, it is combined with herbs of tonifying spleen, inducing diuresis. For instance, it is used with Ren Shen, Fu Ling and Yi Yi Ren in Shen Ling Bai Zhu San from He Ji Ju Fang. For leukorrhagia in thin quality due to dampness-turbid pouring downwards caused by spleen deficiency, it is combined with spleen-tonifying, damp-drying and leukorrhagia-stopping herbs. For instance, it is used with Shan Yao and Cang Zhu in Wan Dai Tang from Fu Qing Zhu Nv Ke. 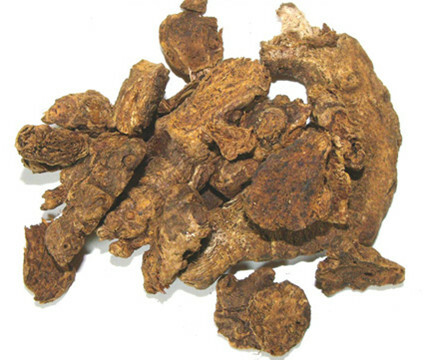 Besides, it can be used with Ren Shen and Huang Qi for bleeding due to spleen deficiency and failure of spleen to control blood, or collapsing of middle qi due to spleen deficiency. It is indicated for syndrome of spontaneous sweating due to qi deficiency, because it can strengthen superficies to check sweating through tonifying qi. It is effective when used singly, or combined with qi-tonifying, superficies-strengthening and sweating-astringing herbs. For instance, it is used with Huang Qi and Fu Xiao Mai. For spontaneous sweating, susceptible to wind pathogen due to exterior deficiency caused by lung and spleen qi deficiency, insecurity of defensive qi, it is combined with lung and spleen-tonifying and wind-dispersing herbs. For instance, it is used with Huang Qi and Fang Feng in Yu Ping Feng San from Dan Xi Xin Fa. It is a key herb for preventing abortion. It is particularly indicated for threatened abortion due to spleen qi deficiency, because it prevents abortion through tonifying qi and invigorating spleen. For threatened abortion due to spleen qi deficiency, it is combined with qi and spleen tonifying, yin and blood nourishing herbs. For instance, it is used with Ren Shen and Fu Ling. For vomiting with poor appetite, weighty and swollen limbs during pregnancy due to damp-turbid stagnation caused by spleen deficiency with dysfunction of transportation, it is combined with qi-tonifying, spleen-invigorating and damp-eliminating herbs. For instance, it is used with Ren Shen, Fu Ling and Chen Pi. Decoct 6~12g, 30~60g in large dosage, stir-baked with bran for enhancing action of spleen tonifying and dampness drying, and stir-baked with soil for enhancing action of spleen-tonifying and diarrhea-relieving. Use with cautions in cases of yin deficiency with fluid injury by dryness-heat pathogen.